Although I did enter the Mslexia pamphlet competition last year I did feel a bit like I was scraping the barrel for poems. But now I’m confident I’ve got a decent number to choose from. 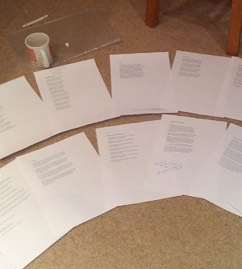 I went through them this afternoon and started looking more closely at them to see if there are any natural orders or themes coming through, and making some decisions about which poems should follow or precede others. Exciting! There is something very exciting about entering poetry competitions and I think you’ve really captured it here. Good luck. Keep us posted! I’m delighted you’re doing this! I also entered Mslexia and the Poetry Business – the only two pamphlet competitions I’ve entered so far. Like you, I felt I was adding extra padding with some poems which obviously isn’t good enough. I don’t think I’ll know if I have enough strong poems until much later this year. For now, I need a clear run at writing. Yes I know what you mean. I still feel I need to write more, so that the final selection really does involve whittling a lot down to the relevant few. Just going through that process is good experience I guess. The photo is great- exactly the same thing has occurred several times at our place. No one was allowed in as the poems jostled for position amongst themselves. I was scribbling themes on them at one point, to see what on earth I had been going on about. Very exciting indeed. Good luck. Thanks for commenting Graham. Yes there can certainly be a few surprises when you look at how they go together!